Go online at www.konabay.com/nobu.pdf to download an IY O Nobu sign. Print out a copy or pull it up on your tablet screen. Take a photograph of you holding the Nobu sign at your favorite (one, two or several) quilt shop(s). Email the photo to nobu@konabay.com along with your name and the name of the Quilt Shop in the photo. THE DETAILS One lucky drawing entrant will win the stunning 86” x 111” Crane Dynasty quilt kit. Plus, the Quilt Shop with the most entries wins a kit and a twopage feature in ASIAN FABRIC magazine. You’ll be their favorite customer! eco friendly insulated hot/cold bags â&#x20AC;&#x201D;new designs! much more about this new and exciting progression and adventure. Along with the usual articles and projects about quilting, sewing and crafts, we will work hard to also share with you knowledge we gain as we explore Washington’s romantic and alluring wine industry. Speaking of projects—Georgie Gerl’s talent never ceases to amaze me. She has artistically embraced our goals bringing you some very special projects in this issue. We are also joined by Sandy Turner, the author of BigPrint Patchwork—Quilt Patterns for Large Scale Prints. Join us as we travel to Ho Chi Minh, formerly known as Saigon. Plus, Andrea Nguyen, a well known author of several Asian focused cookbooks brings you a recipe for one of my favorite Vietnamese meals, the Banh Mi sandwich. I invite you to join us in our new Fabric Vine adventure. Thank you for allowing me to share with you what I find so wonderful about not just fabric and wine, but also the scenic beauty of the Pacific Northwest and its people. Mahalo from Da Textile Samurai! Share it with a friend 1. Click here and choose a method to share. 2. Follow prompts. Use the easy links As you scroll over a page, active links will be highlighted in blue. This enables you to connect to additional pages and download additional patterns. Print pages You must log in and download the publication before you are able to print. 1. Click Share and then choose the light gray Download link below. 2. Open the .pdf to view and print pages as you wish. 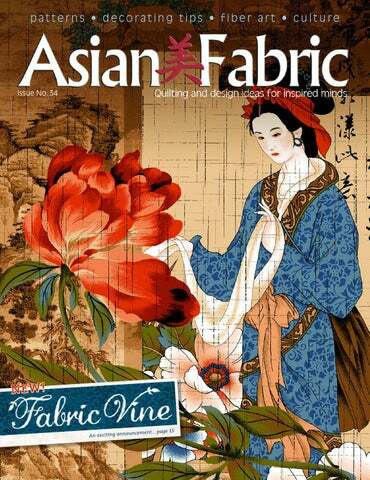 Asian Fabric™ is produced six times a year by Eagle Publishing for Kona Bay Fabrics. The magazine accepts no responsibility for unsolicited manuscripts or artwork; they will not be returned unless accompanied by a stamped, self-addressed envelope. © Kona Bay Fabrics. All rights reserved. No piece, in part or full, may be reproduced without permission. shop directory: where to find kona bay The premiere shops across the country for exceptional service and a superb selection of Kona Bay Fabrics. Sharing Asian prints from Kona Bay Fabric used in a unique setting. The fabric was used to compliment the entries at the Hastings Bonsai Group Annual Bonsai Exhibition held recently in Port Macquarie. Bonsai is the art of growing trees in pots. The age of trees displayed were up to 70 years old. The size of bonsai vary from those that can be held in the hand to trees so large they require a number of people to lift one. This was the Hastings Bonsai Groups first exhibition; we are only a new group that was formed this past June. We are now 90 members strong. The exhibition is still being talked about around town. We have scheduled our next show for February 27, 28 and March 1, 2015 at Port Panthers. Exhibition attendees can look forward to demonstration on how to start out in bonsai in addition to the display. of a wide range of trees from the memberâ&#x20AC;&#x2122;s collections. Members will also be selling surplus bonsai trees from their own collections. nearly 9,000 quilts to the survivors to keep them warm and comfort them. At the same time, instead of giving quilts to them, there was a “quilt making activity” started by a young volunteer group in order to encourage the mind-lost women still in temporary houses. Our quilt group gladly joined the group to support them with a belief that it will inspire those women so that they will find a joy of creation and find hope and dream for their future. We have learned the countless patterns and techniques for quilt making from your country, and at the same time, we are thrilled to practice the “heartfelt gift in every stitch” tradition of quilt making. We are most pleased and gratified to exhibit our 9th quilt show from Japan at La Conner Quilt and Textile Museum. We sincerely hope you can read our wishes and thoughts, stitched and sewn in these quilts. Feeling deeply pitiful for the forgotten and discarded cotton fabrics in Japan, Junko has been working on preserving them. For hundreds of years, cotton fabrics had been preciously and broadly used for common people’s bedding called “Futon” and working jackets called “Hanten” until synthetic textiles were introduced. She collected the fabrics from north to south and made countless miniature Futon and Hanten in one sixth of the normal size. This space does not allow us to display all of them but I hope you will enjoy and appreciate her deep love for the textiles and insatiable passion for her creations. Artist Reception, Workshops, & Exhibit Tours Wednesday & Thursday, July 2 & 3, 2014 Join us at 4:00 on Wednesday, July 2, for an afternoon reception to meet the artists of our Japanese exhibits. Miwako Kimura, Guest Curator of both exhibits, will be leading Exhibit Tours on July 2 & 3. Three Japanese Textile Workshops are planned on July 2 & 3 by Sachiko Yoshida and Noriko Koyama. Instead of wasting fabrics, two quilts are created at the same time while making the half-square triangle units. Additional blocks are made to create two unique lap/wall quilts.
! *4" squares (a" squares &" squares @2" x ! @2"
$ &" x $@" @w" x $@" !2" x $@" @$ !" x $@"
$ &" x $@" @4" x $@"
#2" x ! @2" #2" x ^2" !2" x !@2"
!" x ^2" !" x %2"
Let’s Begin Before you begin read all instructions. Referring to project Cutting Chart, cut First Cuts strips as indicated in chart then cut smaller pieces listed under Next Cuts from these strips. Refer to General Instructions (pages 110–111) for Accurate Seam Allowances and Assembly Line Method to construct this quilt. Use a 4”-wide seam allowance throughout this project. Press seams in direction of arrows as indicated in each diagram. Note: Using the technique in this pattern the half-square triangles resulted in two different looking blocks with only one being used in the Impressive Windmill Quilt so instead of having unused blocks, another quilt design was created to use these leftover blocks. Instead of creating one quilt you will be constructing two different quilts at the same time. Hopefully you will find this a win-win scenario. Making the Strip Set Units These strip set units will be used in making Blocks 1, 2, 3, 4, 8, and 9. 1. Arrange and sew together lengthwise one @4” x $@” Fabric A strip, one !2” x $@” Fabric C strip, one !2”x $@” Fabric D strip , one !2” x $@” Fabric E strip, and one @4” x $@” Fabric F strip as shown. Press. Make twelve strip sets. 2. Cut fifty-six &”-wide segments from @4” step 1 strips assets shown above. Make sets 12 strip &"
Making Blocks 1, 2 & 8 1. Refer to General Instructions (pages 110–111) for Half-Square Triangles. Draw a diagonal line on one &” Fabric B square. Place marked square and one strip set unit right sides together, checking orientation of strip set and angle to be sewn. Sew a scant 4” away from drawn line on both sides, cut on drawn line, and press. Make eight. Trim squares to ^2” to make sixteen half-square triangle units, eight of each variation. Label units either Quilt #1 (Windmill Block 1) or Quilt #2 (Column Block 8). @4” Make 12 strip sets &"
2. Making half-square triangle units, draw a diagonal line on one &” Fabric B square. Place marked square and one strip set unit right sides together, checking orientation of strip set and angle to be sewn. Sew a scant 4” away from drawn line on both sides, cut on drawn line, and press. Make eight. Trim squares to ^2” to make sixteen half-square triangle units, eight of each variation. Label units either Quilt #1 (Windmill Block 2) or Quilt #2 (Column Block 8). Note: The diagonally line is in the opposite direction than step 1. Making Blocks 3, 4 & 9 1. R e f e r t o G e n e r a l Instructions (pages 110–111) for Half-Square Triangles. Draw a diagonal line on one &” Fabric A square. Place marked square and one strip set unit right sides together, checking orientation of strip set and angle to be sewn. Sew a scant 4” away from drawn line on both sides, cut on drawn line, and press. Make twenty. Trim squares to ^2” to make forty half-square triangle units, twenty of each variation. Label units either Quilt #1 (Windmill Block 3) or Quilt #2 (Columnn Block 9). 2. M a k i n g h a l f - s q u a r e triangle units, draw a diagonal line on one &” Fabric A square. Place marked square and one strip set unit right sides together, checking orientation of strip set and angle to be sewn. Sew a scant 4” away from drawn line on both sides, cut on drawn line, and press. Make twenty. Trim squares to ^2” to make forty half-square triangle units, twenty of each variation. Label units either Quilt #1 (Windmill Block 4) or Quilt #2 (Column Block 9). Note: The diagonally line is in the opposite direction than step 1. 3. Sew two Quilt #1 units from step 1 together as shown. Press. Make ten. Sew two units from this step together. Press. Make five and label Block 3. Block measure ! @2” square. 4. Sew two Quilt #1 units from step 2 together as shown. Press. Make ten. Sew two units from this step together. Press. Make five and label Block 4. Block measure ! @2” square. 2. Making half-square triangle units, draw a diagonal line on one &” Fabric F square. Place marked square and one 7” Fabric A square right sides together. Sew a scant 4” away from drawn line on both sides, cut on drawn line, and press. Make four. Trim squares to ^2” to make eight half-square triangle units. Making Block 5 1. Refer to General Instructions (pages 110–111) for Half-Square Triangles. Draw a diagonal line on one &” Fabric E square. Place marked square and one 7” Fabric A square right sides together. Sew a scant 4” away from drawn line on both sides, cut on drawn line, and press. Make four. Trim squares to ^2” to make eight half-square triangle units. 2. Sew two units from step 1 together as shown checking orientation of units prior to sewing. Press. Make eight. Sew two of these units together. Press. Make four. Sew one unit from this step between two 1” x %2“ Fabric I strip as shown. Press. Sew this unit between two 1” x ^2“ Fabric I strip as shown. Press. Make four, these will be used in Block 6. !" 3. Sew two units from step 1 together as shown checking orientation of units prior to sewing. Press. Make eight. Sew two of these units together. Press. Make four. Sew one unit from this step between two 1” x %2“ Fabric I strip as shown. Press. Sew this unit between two 1” x ^2“ Fabric I strip as shown. Press. Make four, these will be used in Block 7. !" Assembling the Impressive Windmills Quilt Fabric A small triangles are used for Corner Triangles and Fabric A large triangles are used for Side Triangles and will be called this in the step instructions. 1. Sew one Fabric A corner triangle to one Block 1 as shown. Press. Sew this unit between two Fabric A side triangles. Press. Make two. 2. Arrange and sew together two Fabric A side triangles, one Block 4, one Block 6, and one Block 3 as shown. Press. Make two. 3. Arrange and sew together two Fabric A side triangles, one Block 3, two of Block 7, one Block 5, and one Block 4 as shown. Press. Make two. 4. Arrange and sew together two Fabric A corner triangles, two of Block 2, two of Block 6, two of Block 5, and one Block 3 as shown. Press. 5. Referring to layouts on pages 35 and 36, arrange and sew rows from step 1-4 together to make quilt top. Press. Tyannn this 65â&#x20AC;? quilt layout needs to appear in the instructions it can be reduce right now it is at 100%. I didnâ&#x20AC;&#x2122;t have room on the chart to place both quilts versions. This technique I was able to make all the blocks for both quilts instructions are together please place both versions of the quilts with fabric fillss on the project cover pages. 1. Arrange and sew together two of Block 9, two of Block 10, and one Block 8 as shown. Press. Make two. 2. Arrange and sew together three of Block 10 and two of Block 9 as shown. Press. Make two. 3. Arrange and sew together two of Block 8, two of Block 10, and one Block 9 as shown. Press. 4. Referring to layouts on pages 34 and 43, arrange and sew rows together to make quilt top. Press. 5. Sew @2” x $@” Fabric A strips end-to-end to make one continuous @2”-wide Fabric A strip. Press. Measure quilt from side to side. Cut two @2”-wide strips to this measurement. Sew to top, and bottom of quilt. Press seams toward border. 6. Measure quilt through center from top to bottom, including borders just added. Cut two @2”-wide Fabric A strips to that measurement. Sew to sides of quilt and press. 1. Cut backing fabric piece into two equal pieces. Sew pieces together to make one &&” x *)” (Windmill quilt) or 72” x 80” (Column quilt) approximate backing piece. Press and trim backing to measure &&” x &&” (Windmill Quilt) or 72” x 72” (Column Quilt). 2. Refer to General Instructions (pages 110–111) for Finishing the Quilt. Layer and baste backing, batting, and quilt top together. Hand or machine quilt as desired. Refer to Binding the Quilt and bind as desired. If making pillows from extra blocks, finished size measures 12” square.Additional materials needed: two 12” pillow forms (or read step 1), 2 yard backing (enough for two pillows), a yard of lining fabric (does not show), and batting. 1. Option: Making a Pillow Form: Measure pillow top prior to quilting and cut two pieces of fabric to this measurement. Using 4”-wide seam sew around all edges leaving a 4” opening for turning. Stuff pillow to desired fullness with polyester fiberfill. Hand stitch opening closed. 2. Layer batting between pillow top and a matching size lining piece (this will not show). Hand or machine quilt as desired. Trim batting and lining even with pillow top. 3. Cut two 9” x 1! @2“ pieces of backing fabric. Fold one long edge of backing piece under 4” to the wrong side and press. Turn under an additional 4” and press. Stitch along folded edge. Repeat for other backing piece. 4. Place quilted pillow top and two backing pieces right sides together matching raw edges and overlapping backing pieces (finished hem edges toward center). Using a 4” wide seam sew around all edges, clip corners and turn right side out. Press. Insert pillow form. Cabernet Sauvignon, Merlot and Syrah are just a few of the wide range of award winning wines that will be available along with a host of other reds and whites. The goal is to merge value and taste to create an exceptional wine experience. 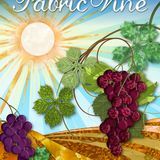 Within each issue of Fabric Vine, several pages will be dedicated to wine enlightenment and entertainment. We’ll continue with the popular fabric pairing and talk about current offerings of WineFromWashington.com. You can also look forward to topics like— Am I using the right wine glass? and Do I drink a Riesling before, during or after dinner? Plus, we’ll include wine and fabric lover friendly recipes along with suggestions for wines that will complement them. Washington wine tourism attracts nearly two million visitors annually. Would you like to be one of them? Where you find wineries, you’ll also find quilt shops. We’ll introduce you to different wine regions and what they’re known for. WineFromWashington .com will be launching soon. You’re invited to sign up to receive an email notification from your favorite Textile Samurai, Douglas Eagleson. Our pairing choices this issue showcase wine grapes from several different regions. We look forward to taking you on more in-depth visits to the wide range of areas in future issues. There are so many great wines coming out of Washington state, it is difficult to choose which to share. Our first choice, the 2012 Chardonnay from Pondera Winery is sourced from the Conner Lee Vineyard in the Columbia Valley in the hotter, central area of the state. The over 100-acres farm was established in the 1980’s and has provided the basis for many award winning wines and a number of Washington wineries. Aged in 80% New French Oak Pondera Winery has a tasting room in Woodinville. It is always a favorite to visit as the family also owns the well established Howard Manville Gallery just up the road in Kirkland. A sampling of striking gallery pieces can always be found in the winery. Many of their wine labels feature artist paintings. Watch for some of their exquisite reds in future issues. The 2008 Mourvedre (moor-veh-dra) from Bunnell Family Cellars is next in our mix. Mourvedre is a lesser recognized but highly drinkable wine grape. It has long been used as a blending grape in France and Spain. In Washington, where part of the state sports the ideal growing conditions, it has gained favor as the primary grape with it’s fruit forward style. It’s easy drinkability will leave you looking for Mourvedre on the label. Bunnell Family Cellars has a tasting room in Woodinville. They anticipate the opening of a second tasting room in Walla Walla on the eastern side of the state soon. Ron Bunnell is the winemaker but the whole family is active in the business all the way down to the little ones you can see featured on their website. Next, we meet the 2009 Fidelitas Champoux Vineyard Cabernet Sauvignon. Charlie Hoppes, Fidelitas owner and winemaker, was named Winemaker of the Year in 2013 by Seattle Magazine’s Washington Wine Awards. After tasting his wines, it’s easy to see why. A visit to their site will fill you in on years of hands-on experience where he perfected his winemaking craft. Vineyards brings together exceptional taste and affordability. Enjoy the wine and fabric notes and let us know if you have any pairing suggestions. The glistening pale straw color arrives in your glass with great promise. It’s a promise kept, as flavors of vanilla custard, lemon zest and hints of nutmeg deliciously invite you to enjoy more. This wine is well balanced with crisp acidity, low alcohol and deft use of oak. “This soft, peppery, seductive wine is one of the most unique Rhône varieties made in Washington. The intensity of the peppery spice, along with the supple, rose-petalinflected red fruits, gives the wine unusual depth and length, despite its apparent lightness and softness. It extends gracefully and fully across the palate, leaving a peppery lift to the finish”.—by Paul Gregutt. The gold metallic highlights the subtle neutral tones of the shibori pattern. Like Chardonnay in a glass, the sense of reflected light relaxes your mind while at the same inspiring creative thoughts of the many possibile uses. Eclectic and exotic design notes layered with non-seasonal rich colors means this coordinate will pair well and accent a wide range of projects. Visualize it drawing your sight into a quilt or stealing the show as a summer dress. Sourced from the Baby Poux Block and Block 11, this is unmistakably Champoux vineyard fruit. The vineyard was first planted in 1972 and is known for producing some of the greatest old vine cabernet sauvignon in Washington State. Nearly opaque in color, the wine offers plum, black currant, and green peppers on the nose. The layered palate adds black fruit tones, cedar and herbal accents with firm tannins and a lasting finish. Drink now to 2022. This wine exhibits beautiful structure, complexity, and length, albeit in a generally riper, rounder style. The palate’s silky texture and fine tannins envelop flavors of ripe blackberry, black cherry, grilled meats, black pepper, vanilla, mint, minerals, and earth with a silky finish. This Syrah is a testament to the unique terroirs of Walla Walla. Properly cellared, the wine should hit maturity in 8-10 years and provide excellent drinking for approximately 15-20 years. The burgundy whispering branches are like old vine vineyards caught just before sunrise. A shadowy mist rising up from the earth looks like clouds in the distance. Available in fourteen colors to make all yours dreams come true. Beckoning summer with it’s bright and hopeful design, the Happy Garden collection will surely make you smile. Dancing blossoms bursting with color long to be nurtured and crafted into a project that will shine for years to come. Sweet memories of travel to wine country display with selections of wines, cheeses, breads, grapes and other delightful appetizers sharing this enticing experience with friends. Chateau Charm Tablerunner/Wall 23" x 59" This quilt features the Shadowland II, Exotic Garden & Blossom Fabric Collections material list Backing !2 yards Batting @&” x ^#” Appliquẻ Assorted Scraps Lightweight Fusible Web Stablizer Read Let’s Begin (page 57) and Circle Appliqué tip (page 77) prior to cutting fabric. *Fabric B is directional fabric, first cut listed runs parallel to the selvage. Extra fabric may be needed if “Fussy Cutting” a particular motif areas.
! !2” x $@” @ ! !2” squares @ !2" x ! )2"
Let’s Begin Before you begin read all instructions including Appliqué General Instructions (page 110–111). Referring to project Cutting Chart, cut First Cuts strips as indicated in chart then cut smaller pieces listed under Next Cuts from these strips. Refer to General Instructions (pages 110–111) for Accurate Seam Allowance to sew a perfect 4”-wide seam. Press seams in the direction of arrows as indicated in each diagram. The instructions given are for Quick Fused Appliqué Method for other methods refer to General Instructions (pages 110–111) for Appliqué Technique. Note: It is recommended to use removable stabilizer on the wrong side of the fabric when machine appliquéing. This will give stability to the piece, even stitching, and prevent puckering of fabric. Note: Excess web can be removed from the center of the circle if desired by cutting a”-2” to the inside of circle marked line. Be sure to test fabrics before doing this technique some fabric when fused to background will show the web ring from the front. Tip: When appliquéing several layers of fusible web I use Soft Fuse Premium™ this product reduces some of the web stiffness that other products have with multi layers. 1. Trace all grape, leaves, vine and circle templates on pages 61–62 on paper side of lightweight fusible web leaving 2” space between pieces. Cut approximately 4” away from trace line. 2. With fusible web paper-side up, fuse to wrong side of fabric scraps following manufacturer’s instructions. Cut on traced line. 3. Refer to photo on page 55 and layout on page 56, to arrange and fuse appliqués to ! !2” Fabric D squares. Tip: For easy placement of grape elements on fabric use an appliqué pressing sheet to make whole grape appliqué units prior to fusing to Fabric D squares. Finish all appliqué edges with machine satin stitch or decorative stitching as desired. Trace tendrils on block and stitch on traced lines by machine or use floss to hand stitch tendrils. Make two blocks, one of each design. 2. Refer to layout on pages 56 and 59 to determine which layout (tablerunner or wall) to make noting the orientation of grape blocks. Sew one !2” x ! !2” Fabric E strip to one appliqué block. Press seam toward Fabric E. Sew this unit to one !2” x ! @2” Fabric E strip as shown. Press. Make one. 4. Sew one unit from step 1 to block from step 2. Press. Sew one unit from step 1 to block from step 3. Press. 8. Sew one #2” x @2” Fabric C piece to one #2” x #)2” Fabric A strip as shown. Press. Make two. 10. Sew unit from step 9 between two units from step 8 as shown. Press. 11. Referring to photo (pages 55 and this page) and layout (page 56) to sew unit from step 10 between blocks from Step 4, noting orientation of appliqué’s prior to stitching. Press seams towards center. 12. Sew !2” x @)2” Fabric E strips to top and bottom of quilt. Press seams toward border. 13. Sew !2” x $@” Fabric E strips end-to-end to make one continuous !2”-wide Fabric E strip. Press. Measure quilt from top to bottom. Cut two !2”-wide strips to this measurement. Sew to sides of quilt. Press seams toward border. 1. Cut backing fabric piece into two equal pieces. Sew pieces together to make one @&” x *)” approximate backing piece. Press and trim backing to measure @&” x ^#”. 2. Press backing and quilt top trimming all excess threads. Refer to General Instructions (pages 110–111) for Finishing the Quilt. Layer and baste backing, batting, and quilt top together. Hand or machine quilt as desired. Refer to Binding the Quilt and bind as desired. Note: Some printers may distort the pattern image. Check to make sure circle measures size indicated. If not, adjust print settings to obtain this measurement. Pattern is for Quick-Fused Appliqué if using hand appliqué traced line will be the stitching line and seam allowance will need to be added. Trace half-circle template on paper side of fusible web two times aligning red dash line to make a whole circle pattern piece. If using a hand appliquéing technique trace circle on pattern paper or template plastic. Before you begin read all instructions including Appliqué General Instructions (pages 110–111). Referring to project Cutting Chart, cut First Cuts strips as indicated in chart then cut smaller pieces listed under Next Cuts from these strips. Refer to General Instructions (pages 110–111) for Accurate Seam Allowance to sew a perfect 4”-wide seam. Press seams in the direction of arrows as indicated in each diagram. The instructions given are for Quick Fused Appliqué Method for other methods refer to General Instructions (pages 110–111) for Appliqué Technique. Note: It is recommended to use removable stabilizer on the wrong side of the fabric when machine appliquéing. This will give stability to the piece, even stitching, and prevent puckering of fabric. Vin Bouteille Wall Quilt 16" x 24"
#" x !#" @" x %" @2" x !%2" !2" x &" !" x @"
1. Trace all wall quilt templates on page 66 on paper side of lightweight fusible web leaving 2” space between pieces. Cut approximately 4” away from trace line. 2. With fusible web paper-side up, fuse to wrong side of fabric scraps following manufacturer’s instructions. Cut on traced line. 3. Refer to photo on page 63 and layout to arrange, center and fuse appliqués to ! )2” x !^2” Fabric A piece. Tip: For easy placement of grape elements on fabric use an appliqué pressing sheet to make whole grape appliqué units prior to fusing to Fabric A piece. Finish all appliqué edges with machine satin stitch or decorative stitching as desired. Trim piece to measure (2” x !%2”. 2. Sew one @2” x %” Fabric C strip to one unit from step 1 as shown. Press. Make two. 3. Sew appliqué unit between two units from step 2 as shown. Press. Finishing the Quilt Press backing and quilt top trimming all excess threads. Refer to General Instructions (pages 110–111) for Finishing the Quilt. Layer and baste backing, batting, and quilt top together. Hand or machine quilt as desired. Refer to Binding the Quilt, page 111, and bind as desired. Extra fabric may be needed for “Fussy Cut” pieces; amount varies depending on motif selection and fabric repeat. Featuring fabrics from the Happy Garden Collections. Before you begin read all instructions. Referring to project Cutting Chart, cut First Cuts strips as indicated in chart then cut smaller pieces listed under Next Cuts from these strips. Fabric A ! !” squares are cut once diagonally as noted in cutting chart these are oversize triangles for the units, having them larger will allow for trimming and squaring of the block to achieve a @)2” measurement. 1. Sew one ! )2” Fabric B square between two !2” x ! )2” Fabric C strips. Press seams toward Fabric C. Sew this unit between two !2” x ! @2” Fabric C strips as shown. Press. Make six. Refer to circle template pages 81-82 to trace and cut 6”, 9”, and 11” (finished size) circles on paper, card stock or plastic template. Refer to Circle Appliqué Tips to determine which appliqué method you wish to use then trace and cut circle fabrics accordingly. Refer to Circle Appliqué Tips (page 77) and General Instructions (pages 110-111) to sew circles to block or quilt when noted in step instructions. Note: It is recommended to use removable stabilizer on the wrong side of the fabric when machine appliquéing. This will give stability to the piece, even stitching, and prevent puckering of fabric. Refer to General Instructions (pages 110111) for Accurate Seam Allowances and Assembly Line Method to construct this quilt. Use a 4”-wide seam allowance throughout this project. Press seams in direction of arrows as indicated in each diagram. This quilt doesn’t use directional fabric. If “Fussy Cutting” fabrics check directions of blocks in layout to determine the best way to cut fabric. Prior to sewing check orientation of blocks in layout and step instructions to sew fabric in correct direction. Yardage needed will vary depending on motif selection and fabric repeat. Making Block 2 1. Using prefer appliqué technique sew one Fabric H medium circle to one ! )2” Fabric E square. Make four. 4. Using simple triangle technique sew one @” Fabric A square to one @” x !$” Fabric G strip as shown. Press. Make four. Sew one unit from step 3 to one unit from this step as shown. Press. Make four. 2. Sew one !2” x #!2” Fabric F strip between one (2” x #!2” Fabric D piece and one unit from step 1 as shown. Press. Make four, two of each variation. Assembling the Quilt 1. Arrange and sew together one (2” x ! )2” Fabric D piece, one !2” x ! )2” Fabric F strip, one ! )2” Fabric I square and one !2” x ! )2” Fabric C strip as shown. Press. Make four. 4. Arrange and sew together two !2” x @)2” Fabric C strips and two of Block 1 as shown, Press. Make two. 5. Referring to center of diagram below sew one unit from step 3 to one unit from step 4 as shown. Press. Sew this unit between two of Block 3 one of each variation as shown. Press. Make two, one of each variation. 7. Referring to photo (page 73) and layout (page 74), arrange and sew together unit from step 6 between two units from step 5. Press. 8. Using prefer appliqué technique, sew one medium Fabric I circle to one large Fabric F circle. Make two. Referring to layout sew these units to center area of quilt. 9. Referring to quilt layout (page 74) sew four of each Fabric G, J, K, and L small circles to outside border area of quilt. 1. Cut backing fabric piece into three equal pieces. Sew pieces together to make one (!” x ! @)” approximate backing piece. Press and trim backing to measure (!” x !!!”. 2. Press backing and quilt top trimming all excess threads. Refer to General Instructions (pages 110-111) for Finishing the Quilt. Layer and baste backing, batting, and quilt top together. Hand or machine quilt as desired. 3. Refer to Binding the Quilt (page 111) and bind as desired. Read Let’s Begin-Cutting tip (page 75) and Circle Appliqué Tips (page 77) prior to tracing circle templates. Koi Chic Quilt—version using different fabrics. Be sure to pick up the original Shadowland Collection Quilts bookâ&#x20AC;&#x201D;remade quilts with new cutting instructions will be made available for download. Must purchase book for instructions. A sandwich from Vietnam Rarely, when we think about favorite Asian dishes, do our thoughts turn to sandwiches. Vietnam is the exception. Banh Mi, a Vietnamese sandwich, offers a whole new sandwich experience from what most of us are used to. Rice rules in Asia, right? It is typically consumed daily by the average Asian family. So, how did a sandwich become one of those, “Oh, let me tell you about…!” kinds of food in Vietnam and the United States in recent years? We must step back in time to 1859. France had invaded Vietnam with the intent of making it a French colony. They were successful and Ho Chi Minh City (formerly known as Saigon), our featured destination in this month’s travel article, was seized. Vietnam remained under Vietnamese rule until the summer of 1954. The lingering influence of the French inhabitants can clearly be seen in Banh Mi with it’s crispy on the outside, soft and light inside, baguette. Insiders claim the secret ingredient is the light and crispy authentic Banh Mi baguette is rice flour others give credit to the process. Our guest author and Vietnamese food master, Andrea Nguyen, shares her recipe for an authentic Banh Mi here. You'll also find useful links to other recipes at her Vietworldkitchen.com site. Inside the tasty outer bread roll, fresh French and Asian ingredients meld together. First, cold cuts, grilled meats, pate and the like are layered onto a mayonnaise covered baguette. The next step is where it gets really interesting and as we depart from the standard sandwich garnish. Instead, we look to assorted pickled vegetables, fresh herbs and chilies to elevate the sandwich to a level worthy of notoriety. Banh Mi is a delectable taste explosion you’ll long to experience again and again. Click here to pre-purchase Andrea Nguyen's The Banh Mi Handbook on Amazon. preparation Slit the bread lengthwise, and then use your fingers or a bread knife to hollow out the insides, making a trough in both halves. Discard the insides or save it for another use, such as breadcrumbs. If necessary, crisp up the bread in a toaster oven preheated to 325ºF, and then let it cool for a minute before proceeding. Generously spreading the inside with mayonnaise. Drizzle in some Maggi Seasoning sauce or soy sauce. Start from the bottom portion of bread to layer in the remaining ingredients. (As with all sandwiches, you’ll eventually develop an order for layering the filling so as to maximize the interaction between flavors and textures.) Close the sandwich, cut it in half crosswise for easy eating, and enjoy. Sandwich Notes from Andrea Light crispy baguette (not the chewy rustic kind) is essential for encasing without overshadowing the other ingredients. Vietnamese baguette is commonly made with rice and wheat flour, which makes for an airy crumb. You can purchase the baguette at Vietnamese or Chinese markets, Vietnamese bakeries and delis, or make your own Vietnamese baguette. A Mexican bolillo roll works well too. So does regular baguette, though avoid sourdough and the overly crusty type. The focal point may be leftover grilled or roasted meat, thin slices of Vietnamese steamed pâté (gio lua), or even seared tofu. Yes, purchased chicken liver pate, even German braunschweiger, can be smeared into a banh mi! Because the daikon and carrot pickle can keep for days in the fridge, you can make banh mi whenever the spirit moves you. Click here to view Andrea’s recipe and suggestions for making a light and airy Vietnamese baguette. An interest in cooking developed when Andrea was still a youngster. Since the age of 10, she spent hours with cookbooks of all kinds and watching favorite PBS cooking shows. Early on, she decided her life and future would honor her fascination with food. Andrea is an award winning author with three cookbooks to her name—Into the Vietnamese Kitchen, Asian Dumplings and Asian Tofu. A new book, The Banh Mi Handbook: Recipes for Crazy Delicious Vietnamese Sandwiches, will be released in July by Ten Speed Press. The list of books Andrea claims to her name would seem like enough of an accomplishment for many but her talents extend far beyond. The Wall Street Journal, Sunset and Bon Appetit are just a sampling of the magazines and newspapers that have featured Andreas articles. Plus, in addition to her print exposure, she has also appeared on many national television and radio programs. Andrea, without a doubt, is a media powerhouse in the realm of Asian cooking. Fortunately for us, Andrea still teaches cooking classes and we can take advantage of her knowledge first hand. Plus, as of 2013, if you can’t make it to a location where one of her classes is offered, you can take one of her classes online through Craftsy. recognize this destination by its better known name, Saigon. In fact, visitors will find that many sites around the city still bear its former name. The cityâ&#x20AC;&#x2122;s long and complex history makes it a fascinating place to visit. the cityscapes are beautiful to behold. Documents and artifacts dating all the way back to the 17th century are on display, and special emphasis is placed on Vietnam’s revolutionary past. The Vietnam History Museum is also found here, notable for its superior collection of ancient ceramics and weaponry. One of its most worthwhile exhibits deals with Vietnam’s various subcultures and highlights the traditional dress of each group. Lucky visitors will get to enjoy a water puppet show in the museum’s tiny theater. One of the city’s most beautiful attractions is the Emperor Jade Pagoda. Built just before the turn of the 20th century, this house of worship is still very much in use. Its many intricately carved figurines are a cause for wonder, while visitors must pause to admire the Jade Emperor, an enormous statue perched atop the pagoda’s roof. shoppers will easily find the gems. Vietnam is sand paintings. Artisans may labor for hours creating these painstaking designs. Extraordinary patience is required while the sand, which is not specially treated in any way, is carefully placed to make designs that range from Vietnamese landscapes to the Eiffel Tower or the Russian Prime Minister. refreshed, let’s get back to dinner. to get a fantastic meal in this city. massage, facial and manicure for $60. home, now is the time to indulge. with beans and coconut creme. good food never seems to end. is to not just survive, but also thrive. by experiencing this grand culture in all of its complexity. Before you begin read all instructions. Referring to project Cutting Chart, cut First Cuts strips as indicated in chart then cut smaller pieces listed under Next Cuts from these strips. Refer to General Instructions (pages 110–111) for Accurate Seam Allowances and Assembly Line Method to construct this quilt. Use a 4”-wide seam allowance throughout this project. Press seams in direction of arrows as indicated in each diagram. Note: Sandy uses a shorter machine stitch length, 2.0mm when sewing bias seams. Yardage needed for “Fussy Cutting” will vary depending on motif selection and fabric repeat. 4. Sew one Fabric C triangle and two units from step 1 together as shown. Press. Sew this unit to one unit from step 3. Press. Make ten. 5. Cut each ^d” Fabric B square once diagonally to make twenty Fabric B triangles. Sew one large Fabric B triangle to one unit from step 4 as shown. Press. Make ten. 6. Cut each @d” Fabric D square once diagonally to make thirty Fabric D triangles. Referring to steps 3-5 arrange and sew together three Fabric D triangles, three units from step 2, and one large Fabric B triangle as shown. Press. Make ten. 9. Sew one unit from step 7 between one unit from step 6 and one unit from step 5 as shown. Press. Make two. 10. Sew unit from step 8 between two units from step 9 as shown. Press. 11. Sew two units from step 6 together as shown. Press. Make four. Finishing the Quilt 1. Cut backing fabric piece into two equal pieces. Sew pieces together to make one $*” x *)” approximate backing piece. Press and trim backing to measure $*” x $*”. 2. Referring to General Instructions (pages 110–111) for Finishing the Quilt, layer and baste backing, batting, and quilt top together. Quilt and bind quilt as desired. sandy turner S a nd y T u r ner ’s lo v e of f a br ic a nd quiltmaking began in 1984. Her quilts have earned many awards at shows across the country. She has been teaching quilt making and loving every minute of it for the past 20 years. By 2005, she was selected as the National Quilting Association’s Certified Teacher of the Year. Sandy has continued to teach and create. Like the folks at Kona Bay Fabrics, she often heard the question, “I love the fabric, but what do I do with it?” in reference to the large scale prints. And, so, Sandy’s journey to becoming a known large scale fabric expert began. It started with an article entitled, “I Love the Fabric, But What Do I Do With It,” published in 2003. From there, she created a Classroom in a book bearing the same name. It can be purchased online in eBook form on her site. Sandy is also the author of Big-Print Patchwork—Quilt Patterns for Large Scale Prints which Asian Fabric reviewed in Issue #30. Click here to read the review. Look for the book at your local quilt shop or visit ShopMartingale. com. The book is available at ShopMartingale.com in two versions. The print version + eBook sells for $24.99 and the eBook only is available for $16.99 and downloadable instantly. Visit Sandy’s website at www.SandyTurner.com to learn more about our celebrated guest and the author of Big-Print Patchwork. How-to Help You! Before You Begin We recommend washing and pressing your fabric prior to cutting it into strips and pieces. To help prevent fabric from fraying in the washer, clip corners at a 45 degree angle removing a small triangle piece. Achieving a Perfect Block Accurate Seam Allowance Use 4”-wide seam allowance for all projects in this magazine unless otherwise stated. If seam allowances differ as little as z” assembling blocks will be difficult, especially when incorporating several block designs in a quilt. To check your seam allowances follow these steps. without breaking threads, continue this process to stitch additional units. Cut sections apart, press and continue with next step. Fussy Cut This process is the selection and cutting of a particular motif pattern which is featured in a cut piece. Remember to center design and always allow for seam allowance. Simple Triangles This is an easy way to make triangles from squares. Step 1 Draw a diagonal line on the wrong side of fabric square that will become the triangle. This will be your stitch line. Step 1 Cut three 12” x 6” pieces of fabric from assorted scraps. Sew pieces together to make one 32” x 6” piece. Press. Step 2 Center strip should measure 1” x 6”. If piece measures differently check to see if seams have been pressed flat. If the piece still differs cut new strips and adjust seam allowance until you achieve the perfect stitch. Pressing Press using steam or dry heat setting. Always use an “up and down” motion since a side-to-side motion can distort the block or unit. Assembly Line Method Use this method when making multiple pieces or blocks. Step 2 Place marked square on fabric piece shown in construction step matching raw edges. Sew on drawn line and trim 4” away from stitching. Fabric A- 2 2" x 2 2" Fabric B- 2 2" x 6 2"
Step 3 Press seams as indicated in construction diagram. Measure sewn piece to check accuracy. Position pieces right sides together, stitch unit. This technique differs from the Simple Triangle method; you will be making two triangles at one time. Step 1 Draw a diagonal line on the wrong side of one fabric square. Place marked square and one corresponding square right sides together. Sew a scant 4” away from drawn line on both sides, cut on drawn line, and press. Fabric F- 2 2" x 2 2" Fabric D- 2 2" x 2 2"
Step 2 Measure unit and trim as indicated in construction diagram. Applique Technique Quick Fused Method This method joins fabric to each other with the use of fusible web. There are many types on the market and you will need to refer to manufacturer’s instruction for specific requirements. If quilt does not require laundering you can use heavy-weight fusible web and follow steps 1-4. If your quilt will require laundering use lightweight fusible web and follow all steps. Remember that appliqués when pressed to background fabric will be a reverse image from patterns provided. Step 1 Trace all appliqué pieces on the paper side of lightweight fusible web leaving 2” space between pieces. Cut approximately 4” away from traced line. Step 2 With fusible web paper side up, fuse to the wrong side of fabric scraps following manufacturer’s instructions. paper backing, a thin film of adhesive will remain on fabric. Step 4 Referring to project photo, position and fuse all pieces of one appliqué design at a time onto background. Tip: An Appliqué Pressing Sheet is very helpful when there are many elements to a design. Place your pattern (reverse image from pattern provided) under the pressing sheet as a guide. Arrange pieces on sheet and press following manufacturer’s instructions. Allow piece to cool, remove appliqué unit and arrange on background to fuse unit in place. If the piece is not cooled, the fusible web could remain on the sheet instead of the fabric. Step 5 If using a machine, cut a piece of stabilizer larger than appliqué area and pin to wrong side of fabric. Stabilizer is used to achieve an even stitch. Using a satin stitch, blanket stitch or other decorative stitching to secure appliqué in place. Start stitching from the background to the foreground. Option: use a hand embroidery stitch instead. Hand Appliqué If project specifies quick-fuse you will need to reverse all patterns and add 4”- wide seam allowance. The steps that follow will add the seam allowance after pattern is traced onto fabric. Step 1 Make a template of all pattern pieces and indicate where pieces overlap. Place template on right side of selected fabric. Step 2 Trace around template using a removable fabric marker. This will be your turn under guide. Cut out shapes approximately 4” beyond traced line. Step 3 When layering and positioning pieces always work from the background to the foreground. needle turn under a small portion of the fabric along trace line and secure with thumb. Using a blind stitch, stitch along folded edge to join piece to background. Stitch is hidden under fabric. Option 1 Step 1 Position binding away from corner leaving 8” free of stitches and aligning raw edges with the edge of the quilt. Sew using a 4”-wide seam. Backing fabric and batting should be 4”-8” larger than the quilt top. Press backing and quilt top trimming all excess threads from quilt prior to basting. Step 1 Lay backing right side down, batting and quilt top (right side up) on top. be taut prior to basting quilt. Start in the center and work out toward edges. You can hand stitch, pin or use a specialty tool to baste quilt together. Step 3 Check batting instruction for quilting requirements. Hand or machine quilt as desired. Remove basting. Binding the Quilt Two options are given for binding the quilt. For both options trim batting and backing 4” beyond raw edge of quilt, this will give fullness to the binding. Sew binding stripes end-to-end to make one continuous strip. Fold and press binding strips in half lengthwise with wrong sides together. To reduce bulk when joining strips, cut ends at 450 angle and sew together as shown. Step 4 Determine length needed for binding strip ends, trim and sew ends together. Stitch binding to quilt. Fold binding to back of quilt, a diagonal fold will form at the corners. Hand-stitch binding to back of quilt. Option 2 Step 1 Measure quilt through center from side to side. Cut two binding strips to this measurement. Sew to top and bottom of quilt matching raw edges with edge of quilt. Press binding away from quilt top. Step 2 Measure quilt through center from top to bottom including the binding just added. Cut two strips to this measurement and sew to sides of quilt. Press.